It's time to think about suspension. 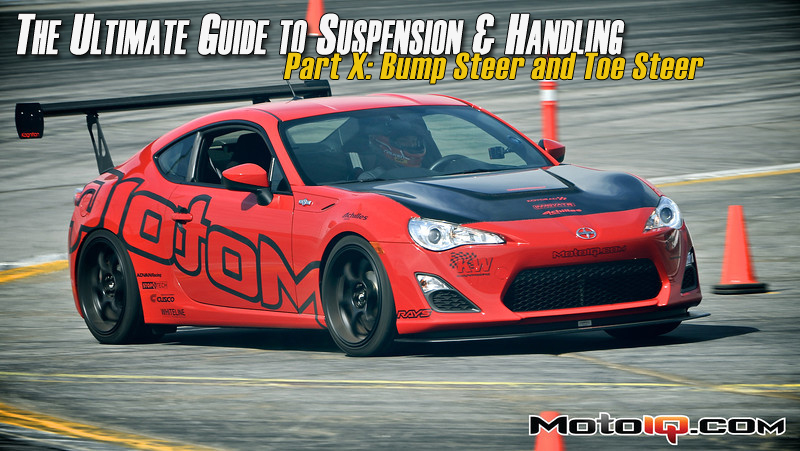 Some of the most common handling problems that you are the most likely to see on modified street cars and race cars based on production chassis, especially in racing classes that do not allow relocation of suspension pick up points are bump steer and toe steer related handling issues. Bump and toe steer can have significant negative effects on a cars handling which is manifested by steering pull, twitchiness, instability, steering inaccuracy and unpredictability. All of these things are scary for drivers to deal with. For most production based modified cars, the most common reason why bump and toe steer becomes a problem is due to over lowering the car. Most modern cars have bump or toe steer by design and over lowering the car puts the suspension geometry in a position that increases bump and or toe steer to the point where it becomes a serious handling problem. This is one of the many reasons why we always suggest lowering a car only 1-2 inches at the most. So now that we've established that bump and toe steer are common and serious issues, how do you avoid and fix them? Read on! Read the whole series and learn how to make your car handle! Steering precision and stability are both affected by bump steer. 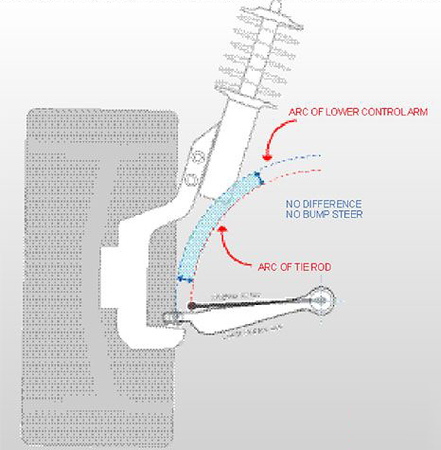 Bump steer is steering input independent of what the driver is doing with the steering wheel created by the suspension moving through its stroke in response to bumps and cornering induced body roll. It is caused by the suspension links moving in different arcs than the steering linkage as the suspension follows its stroke. 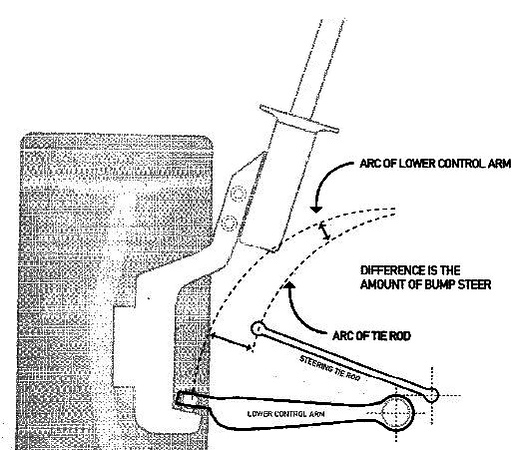 A common cause of bump steer on the popular McPherson strut front suspension car is that the lower control arm and the steering tie rod are out of plane and pivoting on a different axis. The difference in the arcs is the amount of bump steer that results. Usually, the further from the design ride height a car is, the worse the bump steer will be as the difference in angles becomes more extreme. If a McPherson strut suspension has the inner tie rod in line with the lower control arm pivot, bump steer is greatly reduced. 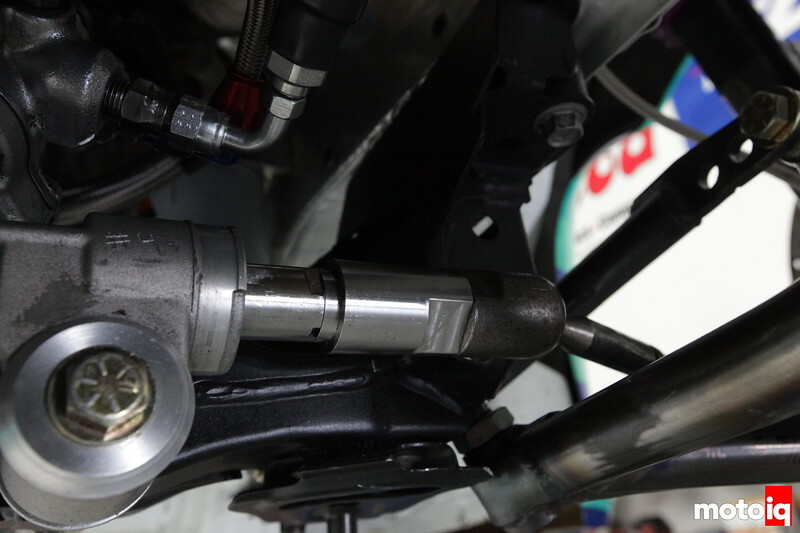 On this race car, a spacer was made to fit in between the steering rack and the inner tie rod to move it outwards which placed it in line with the lower control arm pivot point. This alone got rid of 80% of the bump steer. With the stock steering, this car had a severe issue with bump steer.